As Indiana marches forward with job creation, solid relationships between municipalities and private industry are vital for the state. In the last three weeks, three companies chose to invest in Indiana - GE Aviation investing $100 million in Lafayette; Becks Hybrids investing $60 million in Atlanta; and Casey's General Store investing $30 million in Terre Haute. Economic development in Indiana is strong and getting stronger! Everyone knows that with these announcements comes diversification of our tax base, jobs for Hoosiers, and newly developed property within our industrial parks. However, many people do not realize the strain these announcements can have on our current infrastructure and treatment processes. With Indiana’s low corporate tax structure, we are positioned for further economic development projects. Based on the likelihood of continued economic success, it’s important our public infrastructure managers and corporate representatives that use our infrastructure work together to form relationships and ultimately partnerships. From an environmental standpoint, we are all in this together. Some communities are required by IDEM to implement a pretreatment program for their wastewater treatment system. To implement a solid program, start by establishing a good partnership with your industrial facilities. Communication between industrial management personnel and our local wastewater treatment plant operators is imperative. Some industrial facilities may believe that any process or industrial wastewater sent to the treatment plant gets treated, but this is not the case. Wastewater treatment plants are not designed to treat wastewater with toxic or hazardous chemicals. Industrial wastewater that contains metals, solvents and other chemicals may cause interference in the wastewater plant’s operation or pass through the plant and discharge directly to a stream, lake, river, or reservoir. These waters are often used downstream as the source for another community’s drinking water supply. 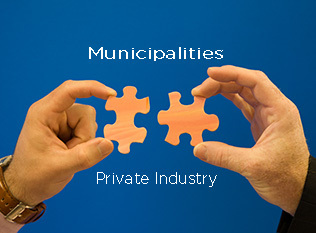 A professional working partnership between industry personnel and municipal wastewater operators allows both parties to find common ground and work toward meeting the state and federal requirements to protect the environment and public health. Clean water is for the common good; everyone can agree on that. How we achieve clean water begins with strong partnerships between our largest dischargers and our treatment professionals. Some people may believe that a municipal Publically Owned Treatment Works (POTW) - or wastewater treatment plants – are the be-all and end-all of water treatment. However, there are required regulations industrial facility personnel must follow to be allowed to discharge process water to the local POTWs. The National Pretreatment Standards and Program was implemented to restrict harmful chemicals from entering the POTW and discharging to streams and rivers. These standards are enforced through federal and state regulations and by local sewer use ordinances implemented by the municipality. The standards limit the type of processed waters allowed to discharge to the POTW. Implementing an effective pretreatment program directly effects the POTW and decreases chemical pollution from combined sewer overflows, avoids damage to the infrastructure, ensures the safety and health of utility employees, and protects the public health and environmental integrity of the community. For some helpful hints on implementing a pretreatment program, download the materials below. This relationship between industries and municipalities is ever more important as Indiana continues to grow, which is putting more demands on our existing infrastructure. Establishing a valuable partnership will help carry out the common goal of protecting the environment and public health by achieving clean water.